In an introductory meeting with the members of the media fraternity held today, Mr. Mrugank Paranjape, the MD & CEO of MCX spelt out his vision and the priorities of the exchange in the near future. He also clarified the Exchange’s stance on various subjects. He expressed confidence that the challenges the exchange was facing since July 2013 following the imposition of Commodity Transaction Tax (CTT), payment crisis at NSEL and exit of several senior employees in the wake of a forensic audit of the exchange’s operations, were over, and that the exchange is on a solid footing with strong fundamentals to reap the opportunities that are imminent. PWC report and its suggested measures having been put in place, it is time that we look forward to launching ourselves on to the next phase of growth, he said. Although factors such as the above, along with a substantial drop in the commodity prices, led to a steep decline in volumes, the Average Daily Turnover on the Exchange has stabilised over time and was 61 per cent higher in May 2016 from the bottom it had touched in November 2013, he said. The market share in fiscal year 2015-16 increased to 84.3 per cent from 84.1 per cent in fiscal year 2014-15. On the merger of Forward Markets Commission (FMC) with SEBI in September 2015, Mr. Paranjape said, this merger of the regulators has changed the landscape of the commodities market in India, paving the path for introduction of new products in the commodity derivatives market, and likely participation of institutions such as banks, mutual funds and insurance companies. At the same time, he believed that the presence of SEBI as the market regulator would help build the confidence in the market for all stakeholders, and make the commodity markets more vibrant, and build a level playing field across the commodity and securities market. He emphasized that technology and human resources are the two most significant elements that have ensured MCX’s undisputed leadership over the years and the Exchange is committed to keep the focus, and continue to invest in these two inimitable resources to capture the new growth opportunities as well as to address the challenges of increased competition that might arise. He said, there has been a 14 per cent increase in employee strength during the last one year which also includes the appointment of five senior management personnel. On the technology front, he cited the existing technology provider agreement that MCX has with Financial Technologies, to meet its technology requirements till 2022. He further added that the Exchange is working with Financial Technologies to upgrade the software to meet all future possible market needs in terms of speed and throughput. Speaking on co-location facility, he said, it is currently not allowed in commodity exchanges, however, the company is also looking to provide high-bandwidth point to point leased lines(1 Gbps plus) for members. Further, as a part of its capacity enhancement measure, the Exchange has ramped up its Disaster Recovery Site IT infrastructure, and upgraded its compute and storage capacity. Moreover, MCX has also set up near online site to achieve zero data loss, he added. Speaking about the new product launches, he said the Exchange was ready with new derivative products such as options and indices. Further the Exchange has also submitted its laundry list of products of interest including agricultural products for regulatory consideration. In line with interests of hedgers especially those from the SME segment, the exchange is also looking at the feasibility of deliverable base metal contracts. He added that MCX’s technology is geared up for the projected volume increase post the introduction of options. On Setting up of Clearing Corporation, Mr. Paranjape said that though SEBI had provided a three year framework for setting up clearing corporation, with enough cash in hand and technology arrangements in place, the Exchange is well poised to operationalise it well before the mandated time. While highlighting about the financial literacy and awareness initiatives undertaken by MCX to reach out to potential hedgers across the country, he said, of the 931 awareness programs hosted during the last three years about 375 are hedgers’ awareness programs aimed at enhancing employability and contribute to the empowerment of commodity stakeholders. With the objective of spreading awareness, enhancing financial inclusion and creating capacities for trainers, MoUs with as many as 10 educational institutions have been signed and many more are in the pipeline, he said. The Exchange is also running a certification programme with the same objective, and to reach the educational initiatives to the masses, the programme is conducted in Hindi and Gujarati, apart from English. He further stated that, the Exchange intends to introduce modules in commodity risk management covering A to Z of commodity price risk management in corporates to impart the skillsets. He also added that as SEBI has mandated the listed corporates to report commodity price risk and hedging practices in their annual reports, MCX is of the belief that it would lead to better corporate governance and transparency going forward. On impending competition from other exchanges including stock exchanges, once allowed to enter the commodity segment, he stated that the Exchange welcomes anything that fosters competition and benefits the consumers, and ultimately the Indian economy. He also sees this as an opportunity for MCX to explore new segments. 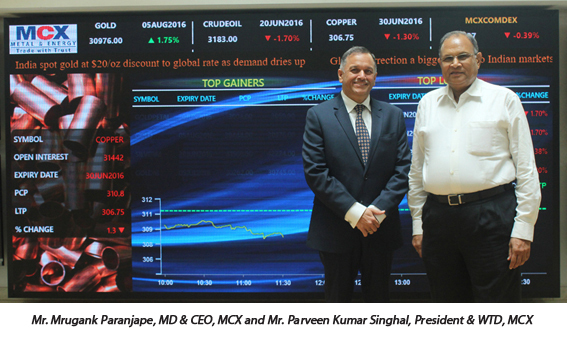 Mr. Paranjape held that the emerging macroeconomic environment is quite conducive to MCX’s growth. With high possibility of rollout of GST in the next few months, and projected growth of Indian manufacturing, the demand for commodity derivatives would naturally increase. 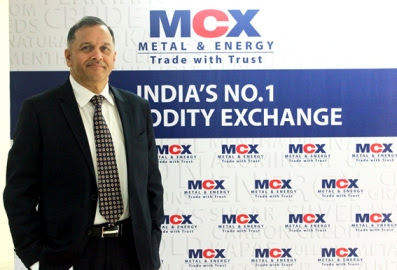 He concluded assuring that his team would be able to steer the Exchange on an altogether higher growth path, so that MCX as the largest commodity exchange in India could contribute effectively in deepening the commodity derivatives market, enhancing hedging interest among potential participants and making the overall market much more inclusive. Having commenced operations on November 10, 2003, Multi Commodity Exchange of India Limited (MCX) is India’s first listed, national-level, electronic, commodity futures exchange with permanent recognition from the Government of India. In the financial year 2015–16, the market share of MCX was 84.30 per cent. MCX offers the benefits of fair price discovery and price risk management to the Indian commodity market ecosystem. Various commodities across segments are traded on MCX. These include bullion, energy, metals and agri commodities. The exchange has forged strategic alliances with various Indian and International commodity exchanges and business associations.